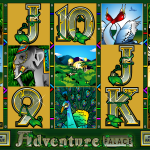 Adventure Palace is an adventurous video slot game from Microgaming. This game takes you deep into the jungle where you have to go on a quest for hidden gold. The main theme of the slot is revolving around exotic animals. 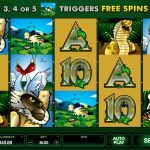 Theme wisely this slot is nothing new since the jungle theme genre has been tested before. It seems that Microgaming did not want to take any new risks with this game and for that reason they play it safe. Adventure Palace is powered with 2 special symbols, the scatter symbol and the wild. The elephant is the wild symbol and its main function is to substitute for every other element but the scatter. But that is not all, your win will be a subject to a x 2 multiplier and every time you land a wild you will also see an entertaining animation. 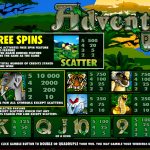 The main feature in Adventure Palace is the free spins round. To activate the bonus round you need to land at least 3 scatter symbols anywhere on the reels. 15 free spins wait for you in this feature and all your wins will be a subject to a x 3 multiplier. When Microgaming have created Adventure Palace they had a clear idea in mind. They chose a theme that is well tested and accepted by punters. On the other hand they wanted to create a simple slot with couple of features just to spice the things up, but at the same time they wanted a very straightforward game. We have to say that this slot is extraordinary and if you have not play it before you should definitely try it out. There will be no place for regrets we assure you. If you believe that the four main elements could bring you luck then you should consider playing Elementals a 5 reel slot by MicroGaming.